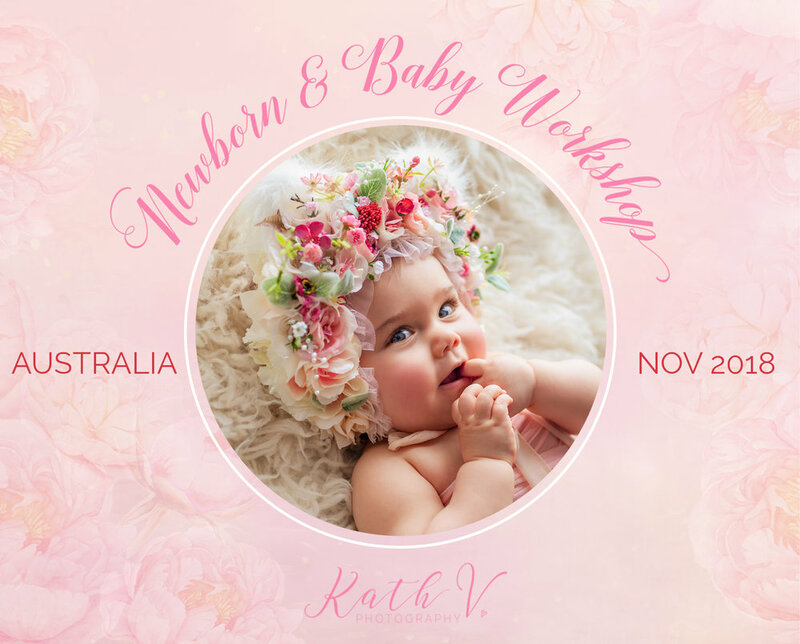 EXCLUSIVE INVITATION TO LEARN FROM MULTI AWARD-WINNING NEWBORN & BABY PHOTOGRAPHER & 2016 VICTORIAN FAMILY PHOTOGRAPHER OF THE YEAR – KATH V.
Kath is a highly sought after International Speaker and Teacher having taught and presented in 5 Continents and 20 countries. Her proudest moment was presenting in front of 500 Brazilian photographers in August 2017 in Sao Paulo Brazil. A day through the lens of Kath V. will explore the essence of creating breathtaking and eternal newborn and baby portraits in an elegant and whimsical showcase as well as building a successful and thriving photography business. The full-day session is designed to be interactive, enticing your individual style to shine. Each workshop is catered to 9 attendees to ensure ample time for individual mentoring, learning and special interest themes. Kath’s passion for newborn and baby photography is infectious, her work is brilliant and this opportunity presents a priceless investment in your career. Whether you are an experienced professional or intermediate level the industry, this workshop will provide a wealth of knowledge, proven business strategies and a mentor in Kath who loves seeing her protégées succeed. *($100 discount will be deducted from final installment). $395 - NON REFUNDABLE retainer due at the time of booking to secure your spot. Open to intermediate or advanced skill level in photography looking to add flair, colour and whimsy to their newborn and baby photography. Attendees will supply their own camera & lens (recommended 35mm or 50mm and 100mm macro lens) and have basic knowledge of Lightroom (or Camera Raw) and Photoshop. Attendees must also have a good understanding (and is confident) in using camera in manual mode. The remainder of the afternoon will take attention off the spotlight and into the nitty gritty of running a successful photography business. It is one thing to take great images and another to create a thriving business; an area that Kath sees many talented photographers fall short. Kath will outline the key marketing, sales and business strategies that she has used to grow the business year after year. Most crucial to Kath success is her ability to sell a session and secure repeat and referral business. Pricing and products will also be covered.